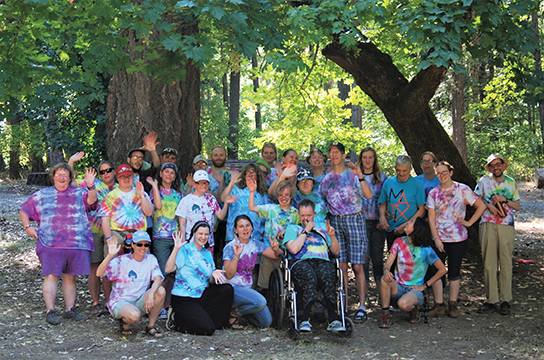 Formed in 1981 by a small group of parents looking for a better life for their adult children with intellectual and developmental disabilities, Ashland Supportive Housing and Community Outreach (ASH) was founded on the principles of respect, dignity and compassion for all people regardless of their abilities. Now in its 36nd year of business, ASH operates three residences, a weekend B&B-style respite home, and a variety of day support services, all serving adults with intellectual and developmental disabilities in Ashland and the Rogue Valley. I spoke with Executive Director Sue Crader and Community Programs Manager Brooks Eakett recently to learn more about this unique Ashland resource and the very special people that it serves. Hi Sue and Brooks. Welcome back and thanks for being here today. Thank you, LocalsGuide. It’s always a pleasure doing these interviews and letting our community know about the exciting programs and new projects at ASH. We have continued to develop our services and to reach out more to the community, and I appreciate sharing our enthusiasm with your readers. Sue, please give us an overview of the services you provide. 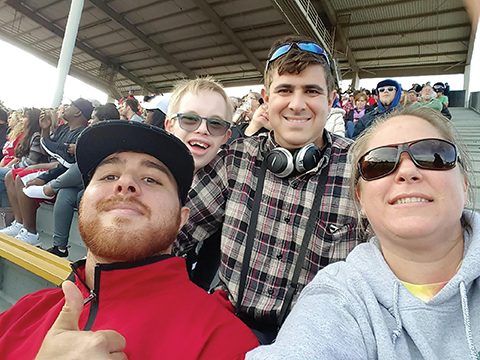 For more than 30 years we have provided the finest personalized care possible to adults with intellectual and developmental disabilities (I/DD). We are so proud of the people we support. Our three group homes offer lovely and safe houses for our residents. We have many long-term residents and they often refer to each other as family. We also help adults with I/DD live independently through our Community Outreach program, which provides the support they need to remain as independent as possible. In addition, the Ashwood Inn, a weekend B&B, serves adults with I/DD and offers a great vacation for guests. What are some examples of the roles ASH plays in the daily lives of your residents? ASH provides a wide array of services in Ashland and the Rogue Valley that allows our residents to live, work, and enjoy their communities. We provide residential homes for people who need 24/7 support, including specialized medical monitoring, we help clients participate in their communities, and we provide support to families by providing respite services. While we assist with many aspects of daily living, our staff recognizes that these are the residents’ homes; we, as staff, are just there to assist when needed. We do our best to recognize each person’s strengths and abilities and we understand that they are individuals with different wants and needs. Who does your Community Outreach program serve? Our community-based programming provides support for people who live in their own homes, with their families or with caregivers. Support services are designed to help people maintain their independence and improve their quality of life. Support includes help with all activities of daily living such as meal planning, grocery shopping, budgeting, medication management, and participating in community activities and events. Tell us about someone who participates in the Community Outreach program. A few years ago, we were contacted by a guardian who was searching for support staff to take a young man on community outings. He had challenging behaviors that were escalating because he frequently did not have the support he needed to get out into the community. We paired him with a support staff member who took him into the community four days a week. Initially, the young man was reluctant to try new activities and only wanted to do the same thing each day. With encouragement, the young man eventually started to try new activities such as walks in the park and meeting new people. His quality of life has greatly improved and his warm smile lets us know that he is very happy. Building community is an important aspect of what you provide for your residents. Please say more. Our mission is to support people with disabilities to live a rich, fulfilling, and productive life with dignity and respect. Our focus is providing safe and engaging social opportunities for the residents. For example, there are many residential home activities such as arts and crafts, musical events, barbecues, birthday parties, and dinners. Also, every summer we host a summer camp that features swimming, archery, dancing, hiking, and just plain relaxing. We have found the residents thrive in the many social activities and they make lifelong friends. Please tell us about some of the new things you have to offer this year. Wow, where to start? We are revising our current ASH website and creating a new site for the Ashwood Inn. This new website will inform people throughout Oregon and beyond about our unique B&B and the wonderful experiences our guests have while staying with us. We just completed a short video on the Ashwood Inn that shows what an amazing time guests have and what a great place Ashland is for a family vacation. Additionally, people can stay up-to-date on our services and activities by liking our ASH and Ashwood Inn Facebook pages and seeing pictures of our many events. The video sounds great! How can our readers watch it? The three-minute plus video introduces the Ashwood Inn staff and shows how guests develop independence and friendships. Also, the video highlights the many fun activities residents engage in, including arts and crafts, Bocce ball, playing music, singing, barbecuing, and eating. The most touching part is the interviews with our guests where they describe what the Ashwood Inn means to them. Parents were also interviewed and they explained how important it is to send their adult children to a safe place. Many of the guests had never been away from home before and, naturally, parents need to be reassured on how well their loved ones will be cared for. We also emphasize how Ashland is a great place for parents to vacation while their child stays at the Inn. To see the video, go to TheAshwoodInn.org. For those that want to tour the Inn, call 541-488-9301. The program you offer at the Ashwood Inn is not very common. Please say more about this unique service. We have found only three other B&B’s in the nation that specialize in providing a vacation home for adults with I/DD. Professionally trained staff are present to prepare meals, provide guests with all required care, and help guests plan and participate in all the activities that Ashland and the Rogue Valley have to offer. This can include everything from seeing a play at the Oregon Shakespeare Festival, attending a concert at the Britt, shopping downtown, or taking a drive to Crater Lake – whatever guests dream up that they would like to do. Many guests of the Ashwood Inn have not had the experience of participating in community activities with their peers. At the beginning of the weekend, staff assist each group of guests in choosing available activities. Guests are encouraged to expand their horizons and try new things; staff provide transportation and support to ensure activities are safe and enjoyable. The three-day weekend structure was created to provide a significant break for families, while also promoting deeper peer relationships that would be more difficult to develop during a shorter visit. The longer time period also aids in increasing independence. Most visitors at the Ashwood Inn return for subsequent visits. Please tell us about one of your guests. A young lady moved to Jackson County several months ago and she was introduced to the Ashwood Inn by her personal agent from Creative Supports, an agency that assists people with I/DD and their families. When we first met with her and her sister, she was finding it difficult to make friends and get involved in activities. We assured her that she had the opportunity to build friendships while staying at the Ashwood Inn. She was a little shy at first, but by the end of the weekend she was full of laughter. Since then, she has stayed at the Ashwood Inn several times and joined us for our annual Halloween party. During her last visit, she said she would like to make a reservation and stay at the Ashwood Inn for her birthday and have a party with all her new friends. Party plans are in the works and she is looking forward to celebrating with her new pals. What are the opportunities for people in the community to get more involved? We are very fortunate to have such dedicated people who serve on our board of directors and generously offer their expertise and insights. We welcome diverse perspectives and encourage community members to be on our board. Even though the state provides some funding, we also need donations to continue offering our many programs, including our annual summer camp. In addition, throughout the year we host public events and a monthly fundraising pizza event in Ashland. We encourage community members to attend our events. 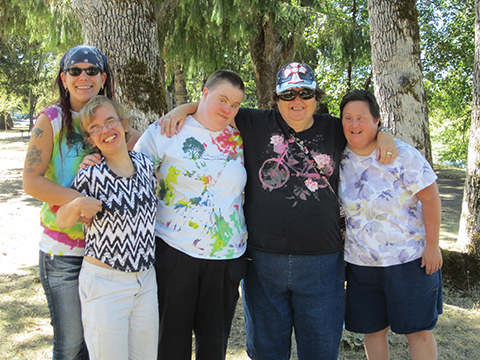 An important part of Ashland Supportive Housing is your summer camp. Tell us more. For the past 30 years we have taken residents and community members for 4 days and 3 nights to the Lake of the Woods area for our summer camp. This is the highlight of the year because they make friends, roast marshmallows, sleep in bunks, and enjoy the outdoors. Many of them do things they have not done before, such as hiking, swimming, archery, star gazing, and dancing under the trees at night. 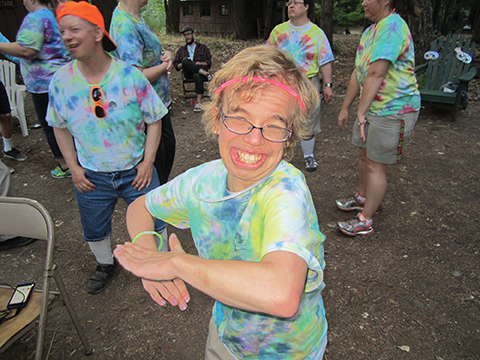 We had a request from one of our campers to dance every night because she loved it so much! Last year, the camp was held at Camp Latgawa and it was a huge success. We already have 14 campers registered for next year, and we are looking to expand the number of campers we can accommodate. It is really growing in popularity! The Camp Latgawa staff even asked if we could stay longer; we are their favorite group and they love being involved in helping our campers have fun. Watch our Facebook page for details. Please tell us about your video premier party. It has taken several months to complete the Ashwood Inn video with the help of our Inn’s guests, their parents, our dedicated staff, and local consultants, and we want to celebrate with pizza! We will premiere the video as well as give awards to the people that participated in the video’s filming on Wednesday, March 8, at Northwest Pizza in Ashland. The public is invited to attend this special event. Why is the second Wednesday of every month a good time to go to Northwest Pizza? It goes without saying that most people love to eat pizza, pasta, burgers, or salad while kicking back with friends. There’s also a pool table, large flat-screen TVs, and video games. We use this as an opportunity for the community and the ASH family to gather, have a great time, and raise money for our residents. Northwest Pizza is generously donating 10% of the profits to our scholarship fund. Please tell us about your open house. Our open house will be held on Wednesday, June 7, from 4pm to 7pm at the Ashwood Inn. The public is invited to meet staff, board members, and residents from the ASH homes. Plus, there will be live music and great food. Last year, almost 60 people came to enjoy dancing, eating tangy barbeque, and good conversation. For those who are interested, tours will be given to see the fully furnished, three-bedroom, two-bath Inn. We really appreciate the strong community support for the Ashwood Inn. The Inn allows both local and visiting families to leave their developmentally disabled loved ones with us while the families enjoy a needed respite from caregiving. Any special thanks you would like to make? Once again, the Ashland Growers and Crafters market has donated produce to us to provide healthy and organic food for our residents. This year we collected almost $10,000 worth of produce! The amount was fantastic and more than we could consume so we donated over a ton of food to the Food Bank. The City of Ashland has been very generous with us this year. We received two grants that will help make our programs more sustainable. We were awarded $5,000 through Ashland’s Economic Development, Cultural, Tourism and Sustainability Grant program. This award helped create the Ashwood Inn’s website, logo, and video. Also, we were awarded a $70,000 Community Development Block Grant (CDBG) for a solar power and water installation at one of our residential homes. In addition, the Carrico Foundation has honored us with another award. The $1,000 grant will help our residential homes become more earthquake ready, which means our residents will be safer in the event of an emergency. Please tell us about your new solar project. The $70,000 grant from the City of Ashland will be used at one of our residential homes; it will help us remain fiscally sustainable because it will greatly reduce our electric bill. We are grateful to have True South Solar and The Solar Collection install the panels and teach us how to use the new technology. Our residents are very excited to see the panels get installed and then learn how to use them.